We have a few traditions when it comes to birthdays in our family. First of all, we celebrate for more than a day–we have birthday weeks and sometimes happenings for our birthday month. It’s all about the celebrating the lives of those we hold near and dear. You get to pick what kind of cake (or pie or big cookie or whatever) you want for your birthday. I spent years asking my Mama for a red velvet cake. Only it was a brown velvet because she wouldn’t use all that red dye. I think there was a study or something…..anyway, never mind the color, it was delicious. For years she made me that. In more recent years, I chose a Texas sheet cake. Ooey, gooey chocolate goodness. My mouth is watering as I type. The birthday supper is a big deal. The honoree gets to choose anything he or she wants. And if you’re lucky enough to have your birthday on a weekend, you get to choose two meals. And so it was for my girl. She came home from college the day after her birthday, so we celebrated all of Saturday. I knew she wanted Mexican food, so I had that planned for supper. But for her birthday lunch, she asked for something I haven’t made in years. Something my Mama used to make, and my new 19-year-old grew to love it sitting around the table with Mama and Daddy and whoever else happened to be at their house. Easily among the best comfort foods ever. The smell of it cooking. I mean, y’all. For real. I was in memory heaven. Mama was a good steward of what was in her pantry and refrigerator. She rarely threw anything out. Over the years she learned great ways to recycle leftovers in a new dish. 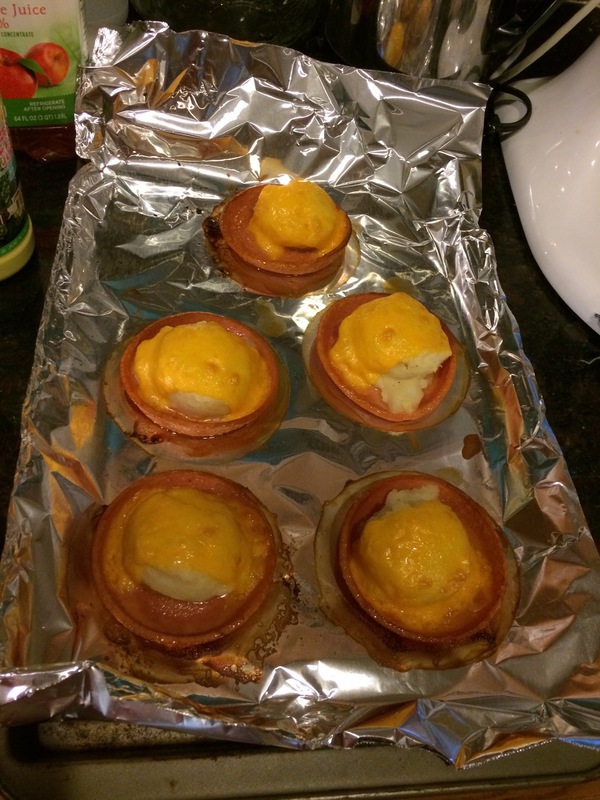 Her way of using leftover mashed potatoes might just be her most creative and best tasting effort of all times. 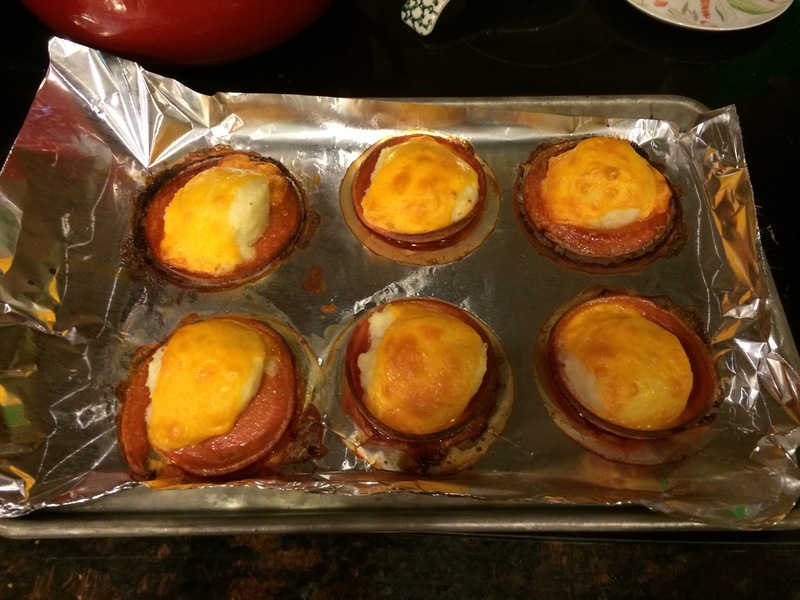 Pan number one of baloney cups….oh the smell of them cooking….. I grew up on bologna sandwiches. I can remember being in my bed, waiting for sleep to come, and singing the O-S-C-A-R M-A-Y-E-R song. We loved our B-O-L-O-G-N-A. I loved taking the red rind off and then making sure I had gotten every bit of goodness off it before throwing it away. Delicious. When Mama had leftover mashed potatoes to use, she used to pull out her biscuit baking pan and lay bologna slices out on it. She’d put a scoop of mashed potatoes on top, and add a slice of cheese. She put it in a hot oven to broil, and voila’ the house smelled amazing, and our taste buds were in for such a treat! She served it with some fruit and we had a meal. One of our favorites, though we didn’t get it very often. I was surprised when my baby girl asked for this for her birthday. Surprised and delighted. The way the house smelled took me back to a safe and happy place, and for a little bit I was home again and my parents were close, and oh–I think I might have gotten the greatest nourishment from those baloney cups, and I never took a bite–my soul was fed and my heart was full. The only problem is I made the mashed potatoes from scratch. And only used about half of them. So now, I have leftover mashed potatoes…..and if a Mama has leftover mashed potatoes, chances are, she’s going to need some baloney to go with it. Love and the comforts of home to all.